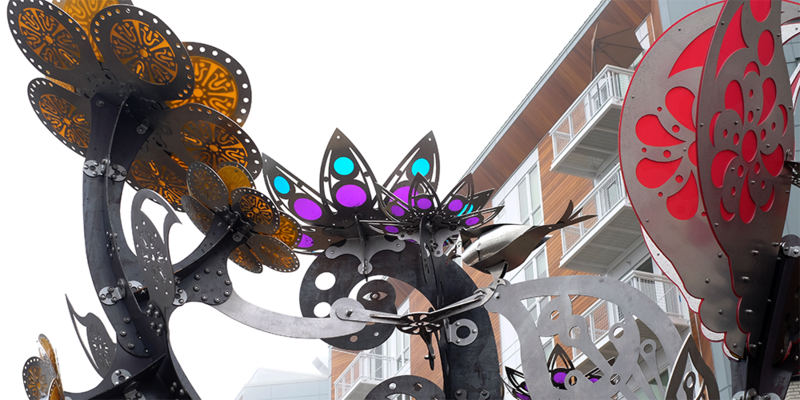 The Yesler community gathered together in late 2018 to celebrate the installation of the Yesler Blossoms art sculpture. Developed by artists Alessandra Panieri and Dan Barsher, the sculpture reflects the personal stories and artwork of residents who participated in artist-led creative workshops within Yesler and surrounding neighborhoods. The piece honors the vibrant diversity of the Yesler community and its tradition and love of gardening. Commissioned by the Seattle Housing Authority and funded by The Kresge Foundation, with additional support from Andersen Construction, Yesler Blossoms reflects the growth and the experiences of the neighborhood. The use of original street paving stones from the original Yesler Terrace community ties the sculpture to the Yesler of old, while the inlaid roots and cardinal symbols connect viewers to past and present journeys. Yesler Blossoms consists of three 13 to 17-foot Corten and stainless steel flower stalks surmounted by curved aluminum and translucent Acrylite shapes. The flowers, inspired by the Hoa Mai, lotus and tulip respectively, rise out of a circular foundation and bench to form a dynamic composition. The design further integrates steel paving inlays and seating. The blossoms are fastened together with approximately 2,500 bolts, nuts and washers. The steel weighs nearly 5,000 pounds, 1,400 pounds more than the Statue of Liberty torch. The sculpture is open to the public and is located between Raven Terrace and Batik apartment buildings on Yesler Way, between 8th Avenue and Broadway. Alessandra Panieri and Dan Barsher are an artist/architect team active in Seattle over the past twenty years. They are known for their use of color, the dynamic quality of their designs, and the creative application of metal techniques. Their work includes fabrication and installation of benches, gates, murals, sidewalk inlays, metal banners and large three-dimensional pieces. As trained architects, they are always looking for innovative and efficient methods to use materials in new and creative ways, and they are committed to fostering a vibrant urban environment where art plays a central role in building and inspiring community.